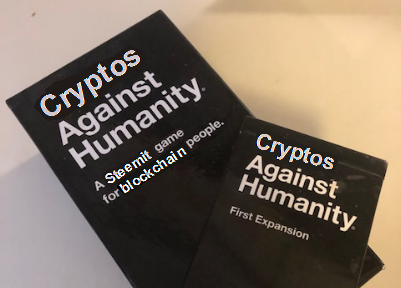 Definitely *Not* A Cards Against Humanity Contest - Week 10steemCreated with Sketch. Hello again, contestants! We made it through Week 9 in spite of freezing temperatures here in New England, and now we're back for Week 10. For those of you familiar with the party game of a similar name, it's a copy with a twist. 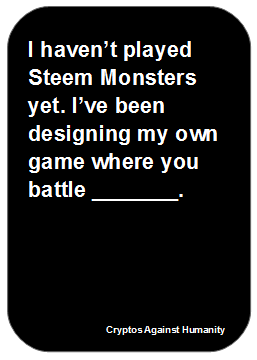 For those of you not familiar with the party game Cards Against Humanity, check out the Week 1 post for more details. I suppose that prompt was a little harder than I thought it would be. But still, some gems this week, as always. You all don't disappoint! by @hyperbole. Congratulations! Back to Roman times we go! No resteem or upvote is necessary, although it is greatly appreciated. If I get paid out more than more than 4 liquid STEEM from these posts, I will increase the number of winners. Use the Random Article feature on Wikipedia to get your valid list of words (your "White Cards", for those of you familiar with the actual party game). This link will take you to a random article. You can use any word(s) on the screen - intro, nav bar, anything! If you want to keep rolling for new random articles, that's your decision, although it's not in the spirit of the game. If you get a very short "stub" article or something written in another language, feel free to roll again though! If you intentionally use a specific Wikipedia article, I can't stop you, but again, it's not in the spirit of the game. Feel free to add the word "a" or "the" or similar "formatting" words to your answer if it would help it make more sense or sound better. There will be three shares of SBI awarded as prizes. I've also set a small Steem Bounty on this post. All valid entries will qualify. I'd also recommend subscribing to @dustsweeper for maximum benefit. This contest will run for a week, at which time I'll close it out, announce the winners, and kick off the next round. Anyway, thanks for playing, and have fun! Here's the random Wikipedia article link again. See you in the comments below! 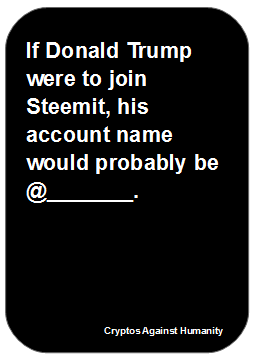 If Donald Trump were to join Steemit, his account name would probably be @_______. @dollarsandsense has set 1.000 STEEM bounty on this post! @sparkesy43 has earned 0.908 STEEM. 0.891 STEEM from the creator of the bounty and 0.017 STEEM from the community! The best. The best. Really terrific. Leonid Nikolaevich Lazarev (Russian: Леонид Николаевич Лазарев, born July 14, 1937) is a notable Russian photo artist and photojournalist. hahahahah! YOu are possibly correct! You have been upvoted and resteemed as part of the @newbiegames selection of top contests for minnows of the day. We invite everyone to follow our @newbiegames account and use the #newbiegames tag for their next game or contest to connect with more of our members and to be added to our weekly curation post. @newbiegames is a part of the #newbieresteemday initiative. Feel free to drop by at our @newbieresteemday Discord Channel. To learn more visit: I'M NEWBIE GAMES AND I'M INTRODUCING MYSELF TO STEEMIT. I'M HERE TO HELP YOU GROW & WIN. Thou hast my most gracious appreciation, I thankee, verily. Oh my! I've missed quite a few. Can I take your mention above to mean that you play M:tG and Settlers? If so, let's play online. If Donald Trump were to join Steemit, his account name would probably be @Pence. Red's Good Groove is an album by American jazz pianist Red Garland with a quintet which was recorded in 1962 and released on the Jazzland label. Yeah, I got nothing. After such a great one last week. And thanks for that one - I really appreciate your choice. I did debate using 'American' instead (for this week's), but neither option seemed great. Haha, always enjoy your entries @hyperbole. I think you've won my top pick at least twice now. "Champion" is pretty good, I can dig it. Reminds me of this prank call, haha. "Who is 'Champ'"? Thanks for the contest, I missed a couple of weeks there! I got a good article with lots of good ideas (Satan, the devil, sinful flesh, wickedness, evil forces), but I'm going to go with "person believed to be possessed"
That I landed on the "International Fellowship of Reconciliation" on Armistice Day has me wondering how random the random feature is on Wikipedia is. Your UA account score is currently 2.921 which ranks you at #11068 across all Steem accounts. Your rank has improved 37 places in the last three days (old rank 11105). In our last Algorithmic Curation Round, consisting of 225 contributions, your post is ranked at #143.